White chocolate is a blend of sugar, cocoa butter, milk and vanilla. It is not considered to be chocolate by some chocolate fans because it does not contain any cocoa solids, unlike milk and dark chocolate, but the thing that makes chocolate special is not just the cocoa solids but the cocoa butter. Cocoa butter is the fat in chocolate that gives it the unique property of being solid at room temperature, yet easily able to melt on your tongue. This means that white chocolate delivers a creamy vanilla flavor and melts in your mouth as well as- or even better than – other chocolates. 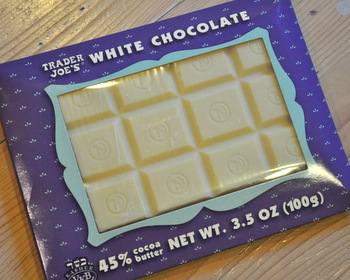 Trader Joe’s recently introduced a small package of White Chocolate that boats a 45% cocoa butter content. The amount of white chocolate. National guidelines dictate that white chocolate must be at least 20% cocoa butter, 14% milk solids, 3.5% milk fat, and a maximum of 55% sugar. The exact ratios vary from producer to producer, but it is still clear that 45% is a very high cocoa butter content for white chocolate. The packaging suggests that this higher cocoa butter percentage gives the white chocolate a more “chocolaty” flavor and I found this to be true when I tried it. The dairy notes that are usually so clear in white chocolate are not as clear here, but the vanilla comes through in the smooth chocolate bar along with a cool, chocolatey flavor that is usually associated with other types of chocolate. This is a good bar for eating, but the high cocoa butter content has a side effect that you might want to watch out for if you’re planning to melt this chocolate and use it in a frosting or a batch of White Chocolate Truffles: cocoa butter has a very yellow color to it, and so does this chocolate, when melted. This doesn’t change the flavor of the chocolate and you can certainly still use it,Â but it does look a little odd compared to other brands that I use in baking (Guittard or Ghirardelli, for instance) so I’ll keep this as a snacking chocolate and probably bake with something else. Such a rich chocolate. I think white chocolate is my favorite type of chocolate. 🙂 Thanks for the warning of the yellowish color of the chocolate when it is melted. Thanks for sharing. I usually race through Trader Joe’s so quickly, grabbing my staples, and I don’t get to spend as much time browsing (somehow my ten month old doesn’t appreciate it the way I do). I must look for this. I LOVE white chocolate. 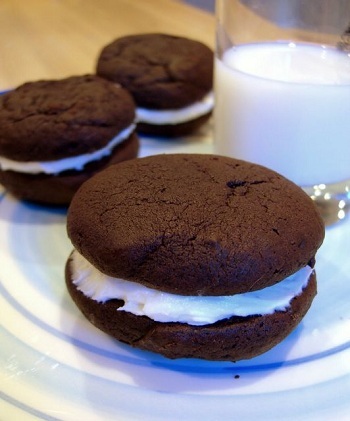 Maybe not so much for baking, but sounds divine for snacking! just bought some today after i remember reading this review. totally delicious! Our store in Westchester County (Scarsdale) told us that they would not be getting more of Trader Joe’s White Chocolate. This is very sad for me. I am allergic to the protein in brown chocolate. TJ’s white chocolate is the most real chocolate taste I have had since I became sensitized to the protein. Please, please do not discontinue this fairly priced and utterly delicious product. Your reviewer is very right — other white chocolates , even very pricey ones don’t hold a candle to this! Please, please!